Crime fiction writer Raymond Chandler once wrote that “anything can happen” when the hot, dry Santa Ana winds sweep through Southern California in the late fall and winter. 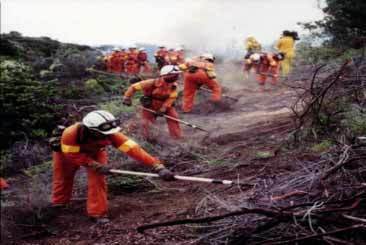 The author might not have had the corrections world in mind, but when the Santa Ana winds roll in, the California Department of Corrections and Rehabilitation’s inmate firefighting crews roll out. The CDCR fire crews are part of the state’s Conservation Camp Program, established in 1946. There are 42 adult and two juvenile conservation camps that house more than 4,400 offenders. CDCR jointly manages the “campers” with the California Department of Forestry and Fire Protection (CAL FIRE) and the Los Angeles County Fire Department. All together, the camps provide 200 crews to respond to all types of emergencies, including wildfires, floods, earthquakes, and search and rescue. They can be deployed anywhere in the state and are located in the areas most likely to need their help. This October wildfires in southern California displaced hundreds of thousands of persons in the largest evacuation in California history, burning approximately 450,000 acres of land and 1,600 structures. They were in large part blamed on the Santa Ana winds for fueling the flames. Throughout the disaster, more than 2,300 CDCR inmates and 170 custody staff joined city and county firefighters to battle and control the fires. 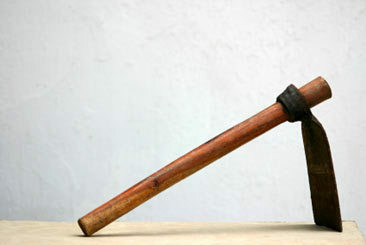 The pulaski is a special hand tool used in wildland firefighting. Its combination axe and mattock, a hand tool similar to a pickaxe that breaks up hard ground, makes it one of the most useful tools for creating firebreaks. Minimum custody adult inmates are eligible to go to the camps if they are medically cleared and have no history of violent crime. Once they get selected for camp, inmates complete a two-week physical fitness program followed by a two-week fire safety and suppression techniques course. Inmates spend an average of eight months in the camps, where they receive ongoing firefighting training. From CAL FIRE’s perspective, the work they do is an invaluable addition to its overall firefighting force. Oftentimes the inmates provide critical support to aircraft fire suppression operations. Crew fighting a fire. See more photos of the CDCR fire crews in the slide show at the end of the article. The work is especially empowering for the inmates who come to the women’s camps. On average, conservation camp inmates provide three million person hours in firefighting and other natural disasters or emergencies. Their work saves California taxpayers more than $80 million a year. The inmates benefit financially as well. The average sentence for adult inmates selected for camp is less than two years. Juvenile offenders must have between four and 36 months left to serve. Even those in the juvenile camps go out on the front lines. “The juveniles do exactly the same work as the adults do,” Thornton explains. Inmate firefighting crews are common throughout the U.S., but none are on the same scale as California’s conservation camps. Thornton knows of at least 14 other states that train inmates in firefighter assistance. “But our program is probably the largest of its kind in the country,” she says. In fact, it remains one of the most successful agency collaborations in California history. As long as the Santa Ana winds are rolling, the conservation campers will be on their guard, ready for anything.